Yasmin Yousof joined the EdVestors team in the fall of 2016 as Office Coordinator. Currently, she is the Executive Assistant and Special Projects Coordinator. In addition to providing daily administrative support to the CEO, Yasmin works closely with the fundraising and development operations team to help streamline an efficient and effective management of EdVestors. 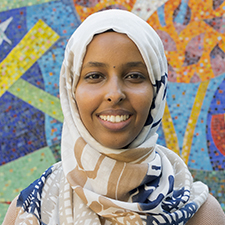 Yasmin interned with the Boston Housing Authority and Boston Public Schools’ Office of Equity. At BPS, she helped design training curricula for school leaders to use with students engaging in bias-based conduct. Yasmin is passionate about education and equity. She graduated from Brandeis University with a B.A. in Education and Politics.